What is your favorite thing about Makoto? That's easy – Makoto makes me feel safe. He doesn't expect me to be the strongest or the smartest, he doesn't care about my talents, he likes me for me. What does Makoto do that is most annoying? As an interrogator paranoia comes with the territory. He's overly suspicious of everything. Going out to eat is a nightmare, he has to check everything for poison before he'll taste it. Well, we first met when we were children, and we trained and even worked together on occasion for years. I didn't really get to know him, though. We never really even talked before he found out what my duties actually were and maneuvered the clan to put a stop to it. He saved me, and I will be eternally grateful. Tea, definitely. Jasmine green tea is my favorite, it's so soothing. Books. Reading has been my escape since I was very young. Since I had to retire from active duty as a shinobi, Makoto convinced me to set up shop as a rare book dealer. I'm a practical man, I only own two pairs of shoes and they're interchangeable. Losing the love of my life now that I've found him. Anything else I can handle. A cat – they're sensuous and lazy, two things I excel at. Do you regret being born and raised a shinobi? I have no regrets. The things I did protected the people I care about. Besides, if things had been different both Makoto and I would still be alone instead of happy together. 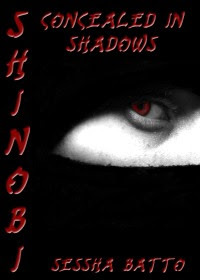 As a bonus, Sessha Batto is giving away two copies of Shinobi: Concealed in Shadows. To be eligible, just leave a comment, and she'll come back Saturday May 5th to announce the winners. shinobi is the japanese pronunciation of the two characters that make the word ninja ;) same thing, different name. Thanks so much for stopping by! wow! Didn't realize Yoshi and Makoto knew each other as children!